Celebrating nearly 50 years of dance and culture, the Ballet Hispánico School of Dance is a leading center of excellence in dance education accessible to the community at large. Ballet Hispánico is an accredited institutional member of the National Association of Schools of Dance (NASD). Dedicated support for the Ballet Hispánico School of Dance is provided by Jody and John Arnhold, The Steven & Alexandra Cohen Foundation, Con Edison, Doris Duke Charitable Foundation, The Harkness Foundation for Dance, The Scherman Foundation, and The Ted Snowdon Foundation. Public support is provided by the New York City Department of Cultural Affairs in partnership with the City Council, and the New York State Council on the Arts with the support of Governor Andrew M. Cuomo and the New York State Legislature. 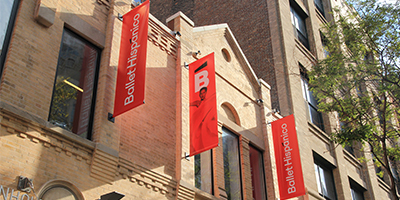 The School is also funded, in part, by the Ballet Hispánico Endowment Fund and patrons of Ballet Hispánico's Annual Spring Gala. We thank all of our other individual and institutional donors for their generosity.